My Dad is here from Australia! It is so nice to have him here and I am loving being able to spend so much time with him. Don’t get me wrong, I would love it if Mum were here too, but it’s nice to have the time with just us two. Dad has combined this trip to the UK with attending a trade exhibition for work in Germany. Dad spent his late teens and much of his 20s working across Europe and eventually left to move to Australia (for the first time) when I was just 3 1/2….yes that’s right people I am in fact German (no not really but I’m sure I could get a German passport of I asked really nicely). Anyhow, despite moving from Germany (well) over 30 years ago Dad’s German was brilliant….to the extent that his German contacts spoke with him in German, rather than in Engligh. I really was a useless ‘assistant’ as my knowledge of the German language is next to nil! Dad had a productive trip. He managed to catch up with a few business contact and find some new products for his business back in Australia. We also had a very lovely but very difficult dinner with some old Dutch friends of Mum and Dad. They have known and worked with Ferdinand and his wife for many many years. Sadly a few months ago Ferdinand was diagnosed with Motor Neuron Disease. He was in amazing shape, but his speech has been affected. He is in a very positive place and is taking it all in his stride. I however, was a different story. It took everything in my will power not to cry like a baby through my meal. It was also a very difficult parting as everyone was trying to be brave, but in actual fact it was probably the last time that we would see Ferdinand. Tough, very tough. Flat packed tea light holders! Money for old rope, my husband thinks! I also bought some lever arch file spine stickers….how pretty are these? Perhaps these are the inspiration I need to get my office tidied up! We had a great tip, but we were both shattered after just a couple of days at the exhibition. 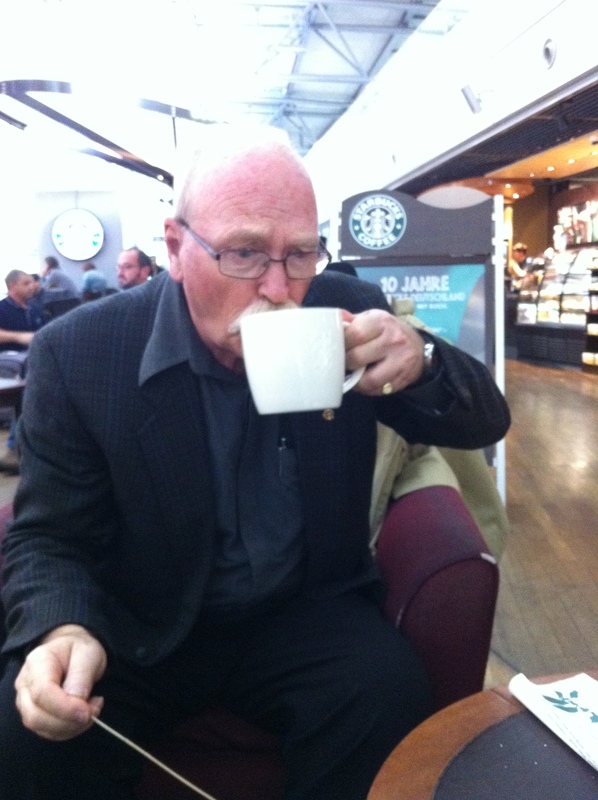 Here’s Dad tucking into a bucket of coffee at the airport on our way home. Please excuse the moustache …he does normally have one but it’s a little more unruly than normal as he’s in training for Movember….expect something spectacular!